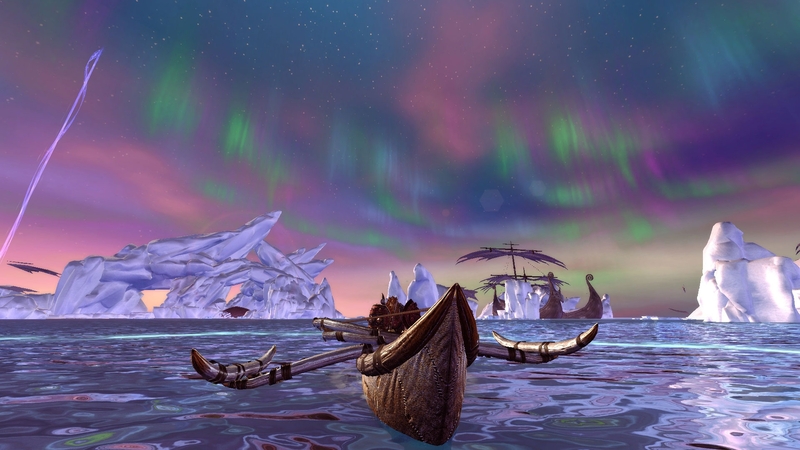 Fishing in the Sea of Moving Ice is a new mini-game that has been added to Neverwinter. 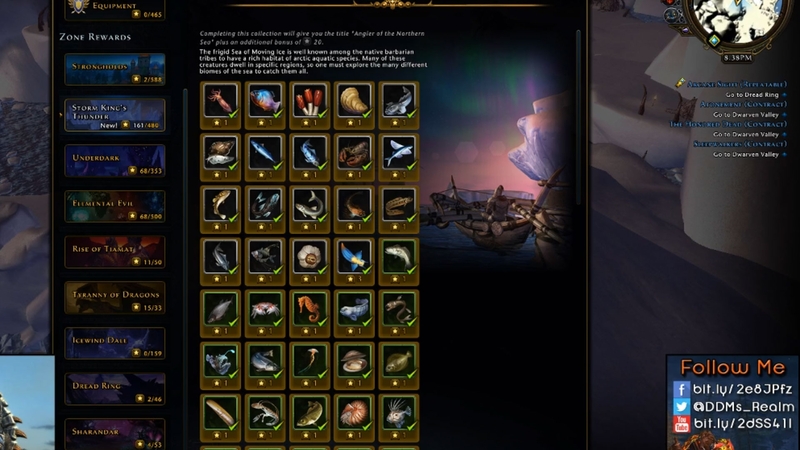 This new fishing activity in Neverwinter is a must if you want to repair the artifact equipment gained at the end of the first series of quests here. It will also be needed to complete a Daily Quest in the Sea of Moving Ice. Players can snag a Map in a Bottle which will lead them to fabulous treasure! First you will need a rod, bait, and a boat. These are all gained through the first series of quests in the Sea of Moving Ice. 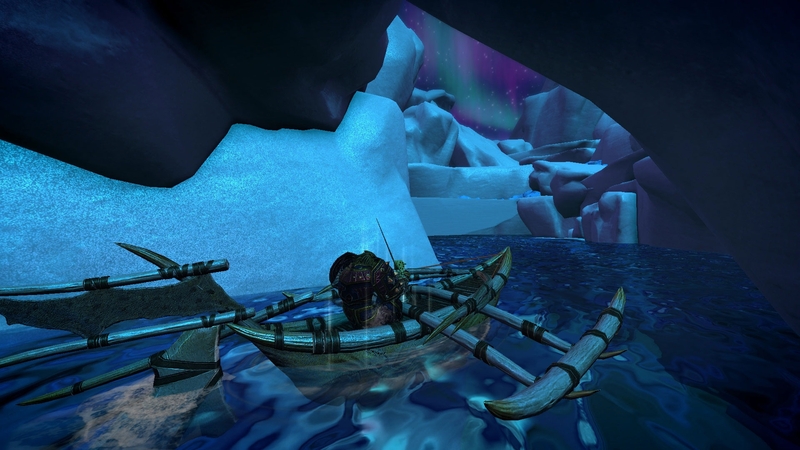 Players are able to fish anywhere in the Sea of Moving Ice from their boat. However, the best places to fish are in fishing holes that are spread around the Sea of Moving Ice. These are easily spotted, first by the flock of birds that fly over them, and also by their blue ring in the water along with all of the splashing fish. In order to fish, stop your boat, preferably in a good fishing spot. Make sure your hook is baited. Click tab to bait your hook. Hit tab again to cycle through your bait. Left click the mouse button to cast out. Then wait for a fish to get hooked. Once a fish is hooked you will see the quality of the fish appear. From – to 5 if you have good enough bait. Click the right mouse button to set the hook. You will have 10 seconds to hook the fish before it leaves. So pay attention! NOTE: If you do NOT want to catch the fish, just let it get away. That will save your bait! Works great when fishing for those elusive Rank V fish to finish off your collection. Now follow the prompts to reel it in. Q E and R keys are mapped to reeling right, back, or left. Click and HOLD the key down until it changes. This will keep you reeling in. When it changes, lift your finger and make sure you click the correct next key. The wrong key press will lower your progress bar. So make sure to switch as soon as it changes. Keep reeling while the progress bar fills. You will have 25 seconds to reel in the fish. Any longer and it kicks off. So don’t dally, reel that beast in! Once your progress bar is full, the Daily Ability indicator will light up. Click 1 to activate it and haul that catch in. Congratulations on your catch! Extra Lugworm bait can be purchased with coin or Voninblod depending on which vendor you go to on the starting island. You will receive Krill bait that is better (green) and should be used instead of worms if available. The only exception to this is Fishing Frenzy Heroic Encounter. Many of your catches will be interrupted by the Dragon Turtle causing you to lose a lot of bait. It is best to just stick with the lesser (white) lugworm bait. A secondary benefit of using this bait is catching lower end fish that can be reeled in faster. This in turn, makes it less likely to be interrupted. The starting quest will give you a white fishing pole. It is nothing fancy, but it does the job. It is slow and landing the purple, rank 5 fish, will be difficult. A better fishing rod is the Ice Hunter’s Fishing Rod that can be purchased from the campaign store. It reels faster and makes it likelier to be able to land the purple rare fish. The Enchanted Fishing Rod is the best fishing pole can be found in the treasure chests that can be opened by using the Map in a Bottle. These are a rare fishing catch but can also be bought from other players or the Auction House. This rod reels quite fast and makes landing those big, slow, purple rare fish easy. The higher ranking the fish, the slower it reels in and the faster the reeling direction changes. So keep an eye on it and change as soon as possible. It is better to lift your finger and pause to make sure the change is right instead of hitting the wrong one. Make sure you do not hit the W key, it will move the boat and make you lose your fish! Once the fishing meter is full lift your fingers off. The reeling will not go down if you are NOT reeling, only if you are reeling the wrong way. A rank of ” – “ is a Map in a Bottle. You can reel these in going any direction. Once you have one you can double click it to get the map. This will show you an image of the location of the treasure. These are well worth your time. Treasures recovered from Map in a Bottle range from bundles of fish, artifact refining materials, upgrading ingredients, rare fishing rods, fast fishing boats, and more. Find a guide to all of the treasure locations as well as some videos to help you get to the hard ones below. Every once in awhile you will get super lucky and pull in two fish instead of one. The second fish can be a fish from any of the other fishing areas. In this Heroic Encounter Fishing event a group of people need to catch a total of 600 points worth of fish in 15 minutes. This might sound easy until you realize that this huge fish frenzy has attracted the dreaded Dragon Turtle! It jumps and swims through the area knocking people around. It even occasionally sprays the entire area with its breath weapon in an attempt to defend its meal. With the Dragon Turtle in play, it can be challenging to hit the 600 mark in time. First and foremost, try to get a group together to start one. Start it by fishing, you can wait until more people arrive to start the timer if needed. Or join groups already working together to complete this. Due to the randomness of the Dragon Turtle, numbers instead of tactics will win this encounter. You will need at least 5 other players fishing diligently to complete this, but 10 are better. It is a good idea to shout out to the zone and try to get as many people working it as possible as the Dragon Turtle WILL throw a wrench in the works. When the Dragon Turtle swims through he will knock players around and interrupt fishing. 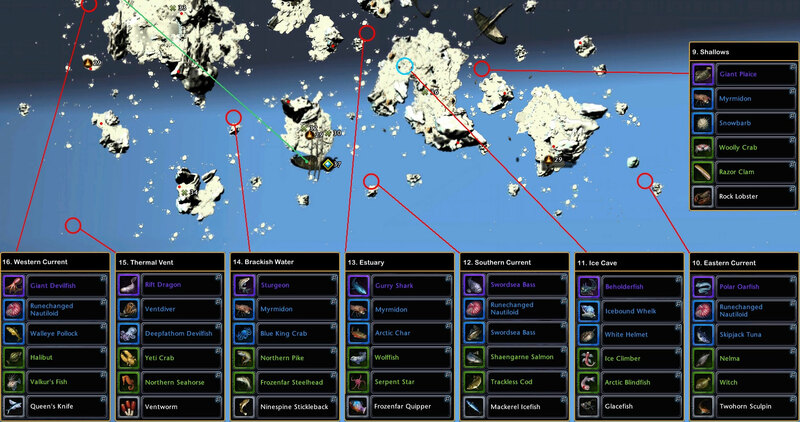 The Dragon Turtle might also surface and begin to spray the entire fishing area. Everyone in the HE as well as nearby will begin to take lots of damage. There is an island in the middle of the Fishing Frenzy Heroic Encounter. This makes a great place to heal. Most players just hang out and fish right next to the island so they can easily get on it when the Dragon Turtle arrives. It is possible to use healing potions in a boat but companions that can heal, using healing Powers, and natural regeneration does not work while in your boat. So hop on the island to heal up and block any break weapons that come through. Even if you do die, there is a campsite nearby that lets you get back to the Fishing Frenzy quickly. Hopefully timing of all of the Dragon Turtle’s appearances hits between catching fish and your group can power through this chaotic Heroic Encounter. There are a few fish that can also be caught in the weekly quest Runestead. So if you are looking to get the complete fish collection you will need to fish the small pond in the north of the map. There is a teeny tiny fishing hotspot here inside a small cave on the pond. Park exactly on it to get the bonus for catching the more rare fish. There is also a hidden treasure chest on the very northern snow drift. Might as well get that while you are there. There are several rare fish that can be gutted. To gut the fish double click on them or right click and select open. This will destroy the fish but get you a rare ingredient for upgrading artifact weapons of this area. Ventdiver can be gutted for Naphtha. Runechanged Nautiloid can be gutted for Runechanged Ink. Icebound Whelk can be gutted for Permafrost Shell. Myrmidon can be gutted for Diluted Vitriol. Well that is about all there is to fishing. This guide should help you track down those rare fish that you are looking for as well as finish the collection achievement title, Angler of the Northern Sea. If you have any questions, comments, or suggestions on fishing or this fishing guide to the Sea of Moving Ice please post below or on social media. I tested this not sure if it was patched but it still uses a bait if it gets away or you cancel it by moving your boat. Thanks! Yes you do lose bait but it saves time. You can trim a few seconds by nudging you boat a bit too. You have to move forward a smidge but you will be able to reset quickly without having to wait the 20 seconds to lose the fish. Hi, great guide thanks for taking the time to put it up. Sure thing! Glad you found it helpful. When I was hunting the last of the blues I went to the fishing spot you can catch them in and cast out. If it WASN’T a IV (4) I moved the boat a bit to interrupt the catch. This went through bait fast but I was able to get the rares in a decent amount of time that way. Did not waste time reeling in fish I did not need. hi there, i am looking to catch the Sea Deva that is locatedin “general waters” is this stating the obvious, i just have to fish where there isnt a blue circle??? Yes anywhere OUT of the fishing holes and you can catch this one. When I was working on my completion I just zone hopped until I found the instance with the fishing hole I wanted was up. It usually did not take too long to find one. They fishing holes spawn randomly. But then they can be “fished out”. 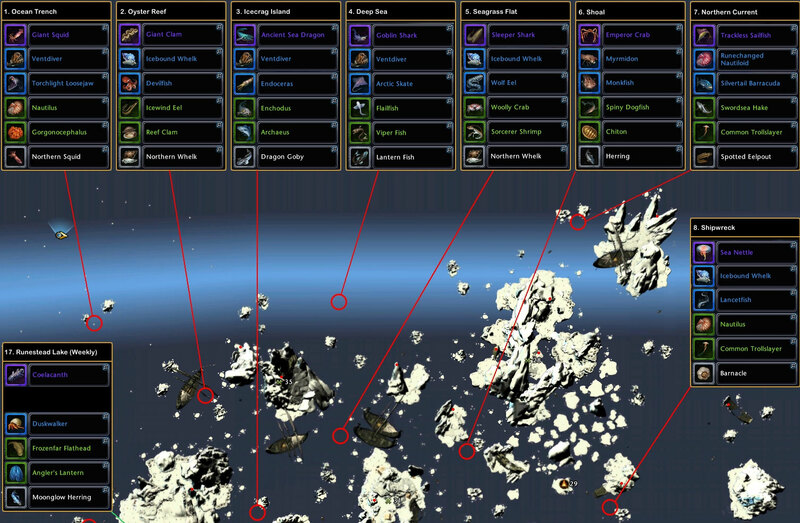 Each fishing spot has X amount of fish that can be caught from it. When it hits that limit. The fishing hole disappears and another one spawns. I always get the unguttable blue fish and never the guttable ones, am I missing something or is it just chance? The guttable ones are rare pulls fishing. Just try to be patient. It can take forever to get them sometimes. So, i have like 16 different types of fish, Rank I-IV, what i do with low rank fishes, sell for gold? Turn them into the barbarian for favor so you can open more chests in SVA.